The Minnesota man who helped a kidnapped girl escape is giving her the $7,000 reward he received for his part in her rescue. Earl Melchert, left, shakes hands with Alexandria, Minneosta Police Chief Richard Wyffels. Earl Melchert is an avid hunter who often looks out over the grassy fields behind his property in western Minnesota, scouting for deer and other animals, his wife said. So when Melchert, 65, spotted movement hundreds of yards away in the grasslands one day last month, he thought it might be just that - a deer. But when the moving figure came closer, he saw it was a teenage girl, a face he instantly recognized from missing posters around town and reports on the local news. For nearly a month, the 15-year-old girl from the nearby town of Alexandria had been held captive in a mobile home by three men. Lured away from her home by a family acquaintance, she was restrained, raped, threatened with guns, and usually kept in a closet, police said. But after 29 days of captivity, she managed to escape, swimming across part of a lake and running through a field until she reached Melchert. He later said he did what "anybody would have done" in the situation. He called 9-1-1, and waited with the teenager for deputies to bring her to a hospital. Over the days that followed, the story of the girl's remarkable escape made news around the world. Her family lauded her tenacity and bravery, and in a news conference Alexandria Police Chief Richard Wyffels called her an "unbelievable young woman." Last week, about a month after the girl's escape, Wyffels called Melchert, commending him for his role in saving the teenager. The police chief told Melchert he was entitled to a $7,000 reward for helping bring the girl to safety - $2,000 from the girl's family, and $5,000 from an anonymous donor. But Melchert refused to accept the reward. Instead he told Wyffels he wanted to give that reward to the teenage girl and her family. "Reward money means absolutely nothing to me," Melchert said to the teenager and her family as he presented them with the money on Friday. "You guys deserve it, and I think it's going to the best place it can go." The money would have been a significant sum to Melchert, who only a week before had retired as an agronomy manager at the Elbow Lake Co-op Grain. He told Wyffels in a phone call that he "could use that money more now than ever," the police chief recounted during the presentation, "but it wouldn't be right." Melchert told the family the ordeal had provided him with "a new look on life." "I just want to say that the good Lord put me in a spot that day that sent me home, made me look at the spot in my field," Melchert said. He had left work that day because he had forgotten something at the house. For that reason, he was on his property just as the girl was walking toward him, still sopping wet from swimming through the lake. "I look at Earl as a hero," Wyffels said to the girl and her family in the presentation of the reward. The teen waited with Melchert in his pickup truck until deputies arrived. At that point, she spotted a vehicle belonging to one of the captors driving right past home. The man, identified by police as Steven Powers, 20, of Mankato, was immediately stopped and arrested. Soon after, officials also arrested Thomas Barker, 32, and Joshua Holby, 31, both from Carlos, Minnesota. All three were charged with kidnapping and false imprisonment. Barker and Powers also face charges of first-degree criminal sexual conduct, and Barker faces an additional charge of second-degree assault. Although some news sources have identified the 15-year-old girl, The Washington Post is withholding her name because she is the victim of alleged sexual assault. "We can't thank you enough for what you did," the mother told Melchert on Friday. "I believe that if you hadn't been there that day that the outcome would've been totally different." Melchert told the family that the experience was one he will never forget. "In fact I've told this story so many times I can't forget it," he said. "I still get people calling me going 'way to go, way to go.' I get guys driving down the street hollering out the window going 'way to go Earl!'" After Melchert presented the family with the check, the girl's relatives invited Melchert and his wife, out for lunch, his wife, Jody Melchert said in an interview Sunday with The Washington Post. The two families talked about the girl's recovery process, and how she was back in school attending classes for a few hours a day, Jody Melchert said. 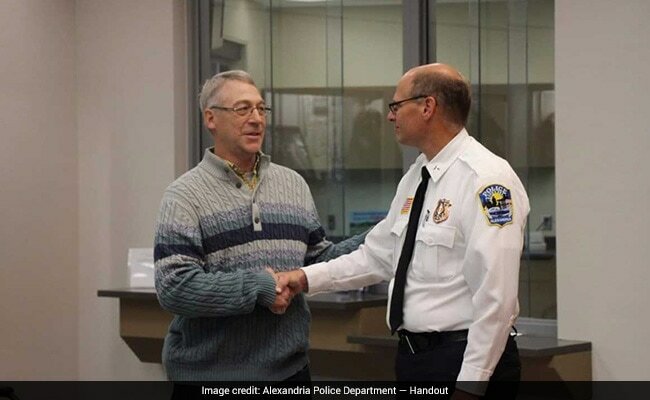 "Today we witnessed an incredible example of kindness," the Alexandria Police Department posted on Facebook later, describing Melchert as "the man who made the call everyone was waiting for" on the day he spotted the girl. "What no one expected was the kindness and generosity that came straight from Earl's heart today," the message read. The girl's older sister echoed the sentiment in an interview with the Voice of Alexandria after the presentation of the reward. "There's good people in the world still," the older sister said, "not many, but there still is, and he's one of them."